What can a banana tell us about socio-spatial transformation along the Voortrekker Road Corridor Integration Zone, in Cape Town? An anecdote in The Walk tells us that a single banana sold along the route can double in price depending on where you buy it. 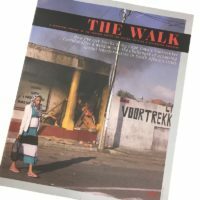 Written by Sean O’Tool and edited and designed by Tau Tavengwa, The Walk meanders across five city blocks along the corridor, offering a window into the challenges of achieving spatial transformation in South Africa’s cities. The publication is based on a research study entitled The Prospects for Socio-Spatial Transformation in the Voortrekker Road Corridor by Mercy Brown-Luthango, which focuses on three areas within the Voortrekker Road Corridor Integration Zone (VRCIZ) namely Maitland, Kensington and Factreton. The main concern of the study was to understand the vision of city officials and politicians, as outlined in major policy documents, and how this compares to the daily lived experiences of those who reside and conduct business in the three study areas. On Monday, 18 March 2019, ACC in partnership with the French Development Agency (ADF) and supported by Mistra Urban Futures launched the publication with a panel discussion bringing together diverse voices on the concept and challenges of socio-spatial transformation. Brown-Luthango, opened the discussion with a brief overview of the research methodology as well as main findings of the study, followed by Juliette Hebenstreit, who contextualised the work within ADF’s work and mandate. Lance Boyd, Senior spatial planner with the City of Cape Town, who works on the VRCIZ underscored the research finding that there needs to be a concomitant investment in social upliftment along with an urban management’ and upliftment approach. while Project officer Ryan Fester from Development Action Group highlighted the importance of bringing all the stands of knowledge from various stakeholders and actors in the area together to inform effective and tranformational strategies. Mercy Luthango-Brown has a background in Sociology of Work. She has worked on a diverse range of research topics. August House is Dead, Long Live August House!